Enjoy the views from this rustic home on high banked property, with a trail to beach. Located on scenic Dungeness Harbor, this shorefront cabin is the perfect retreat for your party of 1 to 6. Set on a large wooded property, 10,000 Waves Shorefront Cabin is very private, and the trail down the high bank leads to the property's private tidelands. Inside the cabin enjoy, floor-to-ceiling windows allow for spectacular views of passing ships, San Juan Islands, Mount Baker, night-time lights of Victoria BC, Canada. There are three bedrooms with accommodations for 6 guests. The master bedroom faces the shorefront and has floor-to-ceiling windows, king bed, skylights, crib, and en suite bathroom. The en suite is a full bath with tub shower combo. There are also two guest bedrooms with queen beds. The guest bathroom is 3/4 bath with a shower. The large open concept living room, dinning room area, has plenty of seating to enjoy the view out of the large picture windows, enjoy a game together on the large flat screen TV, or enjoy evening drinks by the free standing propane stove. The dinning table, set in front of two more large picture windows, comfortably seats six. The galley kitchen is well equipped with stove/oven, full size refrigerator, microwave, four slice toaster, and drip coffee maker. 10,000 Waves Shorefront cabin is fully equipped including high speed internet, wireless network, kitchen, washer/dryer, satellite TV, DVD, VCR, CD player, phone, birding scope, children's toys and videos. The large deck wraps around two sides of the house. There is a picnic table and chairs as well as a Weber gas grill so that you can enjoy outside dining. 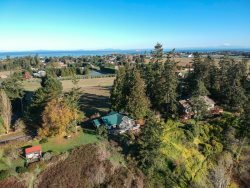 This property is only 10 minutes away from the Dungeness Wild Life Refuge, entrance to the Dungeness Spit trails and beach. It is less than 10 minutes away from Cline spit where you can launch your boat, it is also a favorite spot of wind surfers. The Clallam County Landing Park is only a few minutes further and offer great beach walks and a favorite place for flying kites.Come stay at 10,000 Waves Shorefront Cabin for a private retreat located close to many scenic destinations and offering its own private beach and tidelands. We had an amazing stay and didn't want to leave. The house was clean. The walk down to the beach was quite convenient and beautiful, although we can see how it may be difficult for the elderly or those with disabilities. On a clear day we could even see Canada from the deck. Beautiful views!! Everything was very clean and comfortable! We used this as our base to drive into the National Park which means we were gone quite a bit (lots of driving). Wish we had more time just to relax at the cabin and enjoy! 10,000 Waves was a relaxing, restorative space with access to the beach as well as a view of the sound. It was a well-organized space which easily accommodated our family members with enough privacy for everyone. The beds were extremely comfortable and we all slept better than expected. We hope to return for a longer stay in the future. Beautiful place with lovely views! The access to the beach is easy and the House was perfect! Check in is at 3pm and check out is 11am. Deposit: Fifty percent of the total rental amount is taken when reserved and the second half will be taken thirty days prior to your stay.